For the painting, see The Birth of Venus. 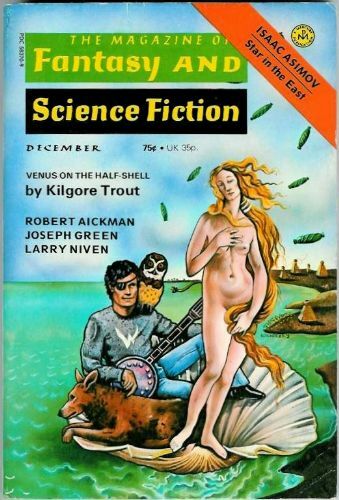 Venus on the Half-Shell is a science fiction novel by American writer Philip José Farmer, writing pseudonymously as "Kilgore Trout," a fictional recurring character in many of the novels of Kurt Vonnegut. This book first appeared as a lengthy fictitious "excerpt"—written by Vonnegut, but attributed to Trout—in Vonnegut's God Bless You, Mr. Rosewater (1965). With Vonnegut's permission, Farmer expanded the fragment into an entire standalone novel (including, as an in-joke, a scene that incorporates all of Vonnegut's original text). Farmer's story was first published in two parts beginning in the December 1974 issue of The Magazine of Fantasy and Science Fiction. The plot, in which Earth is destroyed by cosmic bureaucrats doing routine maintenance and the sole human survivor goes on a quest to find the "Definitive Answer to the Ultimate Question," was paid homage by the later Hitchhiker's Guide to the Galaxy series. According to Farmer's introduction in Venus on the Half-Shell and Others, Vonnegut was initially reluctant to allow the project, but finally relented. After publication, a poorly worded magazine article gave Vonnegut the impression that Farmer had planned to write the story regardless of his permission, which angered Vonnegut. Also, it was popularly assumed that Vonnegut wrote the book. This problem was solved by the book being reprinted under Farmer's by-line. A common element to this novel is the origin of many of the characters' and locations' names. Farmer "put in a lot of references to literature and fictional authors... Most of the alien names in Venus were formed by transposing the letters of English or non-English words." The title and paperback cover art are a reference to an Italian Renaissance tempera painting by Sandro Botticelli, The Birth of Venus, which depicts the birth of the goddess Venus as her rising from the sea on a scallop shell. The phrase "on the half-shell" commonly refers to a method of serving oysters. In 2013, Titan Books reprinted Venus on the Half-Shell with new cover art referencing The Birth of Venus. Raproshma rapprochement phonetic rendering of the French word meaning approximation. ^ a b c d e f Farmer 2008, p. 23. ^ "Philip Jose Farmer - Venus on the Half-Shelf cover reveal". Upcoming4.me. Retrieved 19 March 2013. Farmer, Philip José (2008), Venus on the Half-Shell and Others, Subterranean Press. This page was last edited on 24 October 2018, at 13:54 (UTC).